Robert Nkemdeche, Grayson (Loganville, GA) 6’4″ 300 lbs. Nkemdiche attended Grayson High School, where he was a three-sport athlete in football, basketball and track. He played as a defensive end and running back for the Grayson Rams high school football team. In his junior season, he registered 59 tackles and 18 sacks on defense while also running for 528 yards and scoring 17 touchdowns on offense. Grayson went undefeated throughout the season, finishing 15–0 with a GHSA 6A state title win over Marietta Walton. In his senior year, Nkemdiche registered 59 tackles, 12 tackles for loss and seven sacks on defense, whilst on offense he had 235 total rushing yards and 10 touchdowns. The Rams went on to a 10–2 season record, before losing to North Gwinnett in the second round of the GHSA 6A state playoffs. 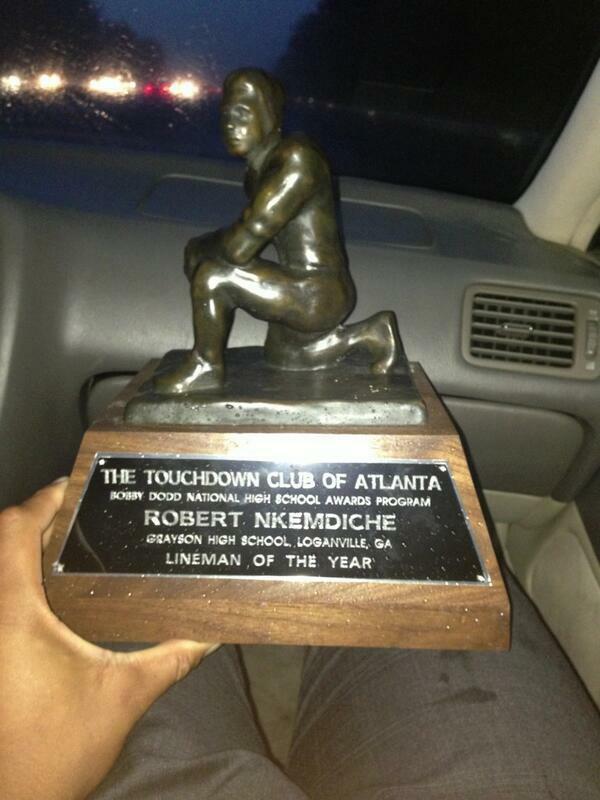 Nkemdiche was the Gwinnett Daily Post Defensive Player of the Year. He finished his career at Grayson with 41 career sacks. He was named first-team All-American as a junior by MaxPreps, as well as second-team as a senior. ESPN & Rivals named him as the top recruit in the nation. Nkemdiche also competed in track & field during his junior season. At the 2011 Gwinnett County T&F Championship, he earned second-place finishes in both the shot put, with a throw of 13.41 meters (43 ft, 8 in), and the discus, with a throw of 37.98 meters (124 ft, 5 in). In addition, he also had marks of a 350-pound max bench press, 335-poundpower clean, 500-pound squat and a 4.56-second 40-yard dash time.